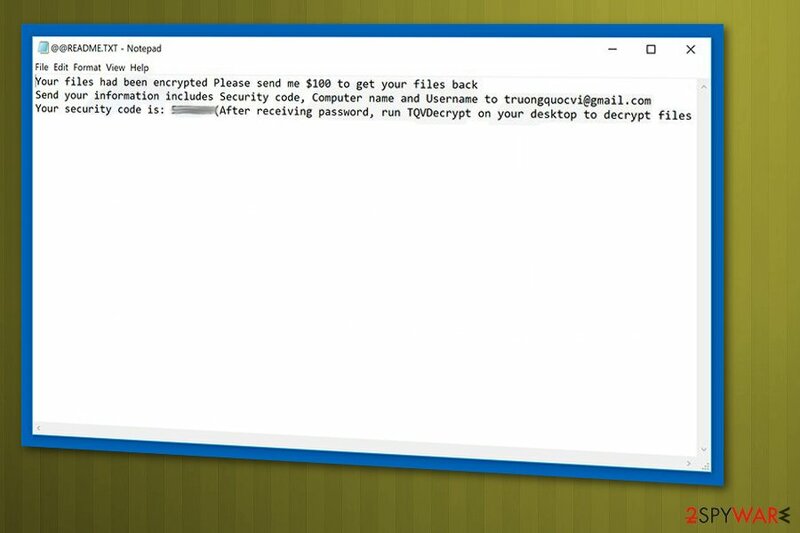 TQV ransomware uses sophisticated techniques to infiltrate computers and hide from its victims. Use Reimage to determine whether your system is infected and prevent the loss of your files. TQV ransomware is a malicious virus that encrypts files with AES encryption and demands a ransom for decrypting these files. TQV ransomware is one of the most dangerous cyber infections that infiltrates the system silently, scans it for specific files and encrypts them. After the encoding is done, each file gets .TQV file extension. After a successful encryption process, ransomware saves a ransom message in a text file called @@README.TXT. This note contains email address truongquocvi@gmail.com which is presented by cybercriminals as the only way to contact them. Also, this message informs the potential victim that the ransom amount which is required for unblocking locked files is $100. While trying to hide their identity, cybercriminals prefer cryptocurrency. However, do not initiate any contact with these people and do not pay the ransom. Virus developers can't be trusted, and the only thing they want is your money. TQVDecrypt can be completely useless just like any other decryption tool that belong to hackers. It is unknown which encryption method is used by this ransomware. However, it seems that the virus is combining symmetric and asymmetric cryptography to make users' files unusable. Besides, if new files are saved on the infected machine, there is a possibility that TQV virus will encrypt this data as well. However, no matter how actively hackers are pushing their decryption tool called TQVDecrypt, beware that there is no guarantee that you will get the key that you need after sending your money. If got infected, you need to remove TQV ransomware from the system. Otherwise, the virus can access and modify Windows registry keys or other essential system settings. When ransomware infects the system, it can easily disable your antivirus program and change different system components to lead it to malfunction. Researchers note that the only way to stop this cryptovirus is using professional tools. For TQV ransomware removal, we advise using Reimage which has already been tested with such viruses. The main pros of this app are its quick activity on the system and the fact that it can not only remove malicious files from the system but can also recover damaged system components. Once you end with virus termination, you can try following our tips for data recovery. If you have no backups of the encrypted data on your external drives or cloud, you can use the recommended software. TQV ransomware is a crypto-virus that asks $100 in Bitcoin for its special tool called TQVDecrypt. The most common way used to spread ransomware is spam. Beware that scammers can set up various trustworthy-looking emails that can be filled with infected attachments. These emails may contain either infected PDF/Word documents or malicious links that can also lead to infection. Social engineering is a technique used to trick people into opening these infected files without even thinking. However, you just need to be careful and double check email messages before opening to prevent ransomware's infiltration. No matter how trustworthy emails seem, make sure you double check the service or company they are representing. The best way to avoid these infections is paying close attention to the sender's email address, the subject, and message body. You need to check the email message for grammar or typo mistakes because hackers tend to make mistakes while writing. If there is nothing suspicious but the email still seems phishy, you can always contact the sender. To remove TQV ransomware without leaving any leftover files, you should employ anti-malware tools like Reimage or Plumbytes Anti-MalwareMalwarebytes Malwarebytes. This makes a big difference because these programs can detect existing malware and remove it in a few steps. If you try to do it manually, you might take a much longer. 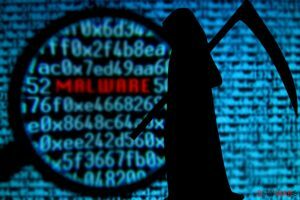 Also, manual virus removal might not give positive results since ransomware comes silently and additionally initiates numerous changes to the system. This secret infiltration means that the virus can have additional pieces hidden in multiple places on the system. TQV ransomware removal needs to be done immediately after you notice virus activity on the system because the more time you give to this cryptovirus, the more changes it can initiate. After you finish the elimination, double-check if your system is clearly repeating a scan. Then, proceed to data recovery. For that, try one of the data recovery methods below. Log in to your infected account and start the browser. Download Reimage or other legitimate anti-spyware program. Update it before a full system scan and remove malicious files that belong to your ransomware and complete TQV removal. System Restore feature might help revert your computer to the previous state. After setting your computer to previous date, run a full system scan. When a new window shows up, click Next and select your restore point that is prior the infiltration of TQV. After doing that, click Next. Once you restore your system to a previous date, download and scan your computer with Reimage and make sure that TQV removal is performed successfully. Guide which is presented above is supposed to help you remove TQV from your computer. To recover your encrypted files, we recommend using a detailed guide prepared by 2-spyware.com security experts. Decryption tool for this ransomware does not exist. ^ Sarah. Spotlight on ransomware: Ransomware encryption methods. Emsisoft. Software blog . This entry was posted on 2018-08-01 at 09:16 and is filed under Ransomware, Viruses. You can quickly scan the QR code with your mobile device and have TQV ransomware manual removal instructions right in your pocket. How did you remove TQV virus?